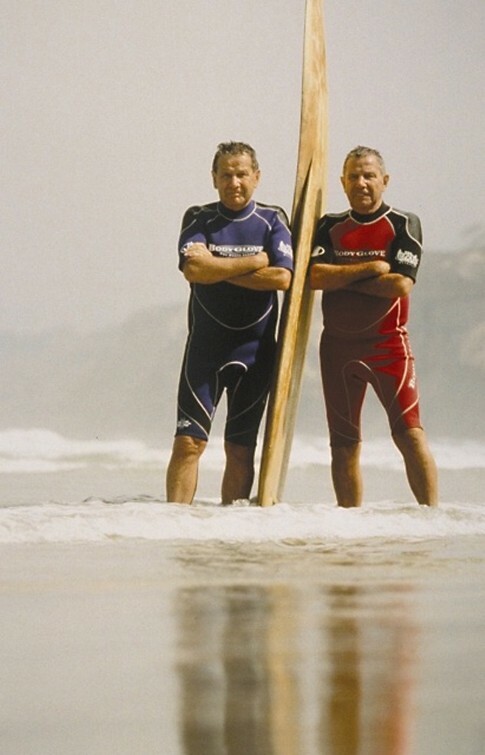 Bill & Bob Meistrell "2007 Surf Culture"
The Meistrell twins, despite being born in Missouri, had water in their blood since birth. Bill came out of the womb just a few hours earlier than Bob in July of 1928 and although they had different birthdays, Bill would always joke about his seniority. The identical twins’ love for water spawned from their childhood home overlooking the municipal pool. At age 14, they constructed their own dive helmet, made of a vegetable can, a pane of glass and tar. After countless swim meets and scuba dives in lakes, the family moved to Manhattan Beach in 1944. Their dreams of finding sunken treasure were now that much closer. But once in California, the boys bought an authentic dive helmet for $25, even though the original owner died while using it. At age 18, they started surfing around the Manhattan Beach area and began lifeguarding while continuing to dive off the Redondo Beach breakwater. Both were drafted during the Korean War. Bob was stationed in Northern California and was able to brave the chilly waters of Pleasure Point in Santa Cruz while surfing in an army sweater. Meanwhile, Bill was in Korea and actually stumbled upon a temporary lifeguard position that kept him close to the sea. In 1951, the twins received a prototype diving wetsuit from Bill’s friend Bev Morgan. Morgan manufactured the first commercial wetsuits and soon opened Dive N’ Surf in Redondo Beach. O’neill claims to have invented the neoprene wetsuit in 1952, just one year before the Dive N’ Surf brand wetsuit was introduced. 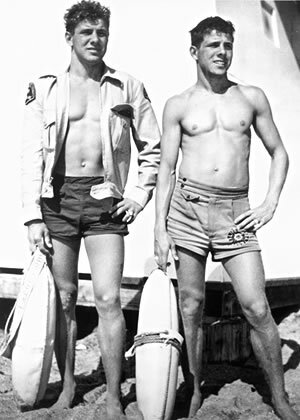 The brothers became partners in Dive N’ Surf in 1953 and slowly began selling the cumbersome dive suits to surfers. It wasn’t until nearly ten years later that the surfing public began to embrace wetsuit use. After a few years under the Thermocline name, the Meistrell’s founded the Body Glove mark in 1965 and soon became the industry leader, second only to O’neill for decades. The Body Glove brand along with the hand logo is one of the most recognized icons in the water sports industry, as annual sales approach $200 million. Body Glove manufactures wetsuits for every water sport as well as clothing, shoes, sunglasses, life-vests, and countless other accessories. While the twins were practically inseparable on land and in the water, Bill passed away on July 25, 2006. “Until Bill became very ill, an average year had us spending 360 days together,” said Bob. “Bill was my best friend and a fantastic brother. I will miss him terribly.” Safe to say, the entire water sports community is now missing a part of its heritage.